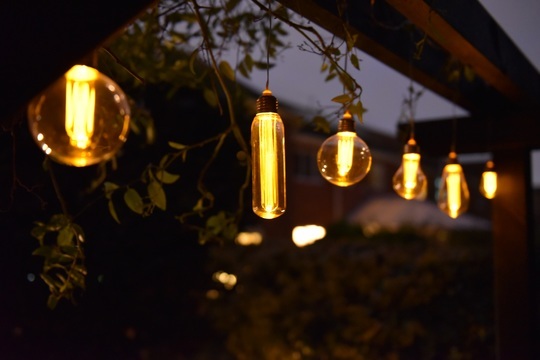 Garden Solar lights hanging from pergola. Very warm white solar lights, hanging from the pergola in the back garden, photo taken winter evening January 2nd this year. Lovely to see some thing original nice shapes too. Thank you Karen and Thrupennybit, bought them from a local garden centre, not too expensive either! Like the vintage feel to them. Yes and a bargain too.